The center Samuel More is a light yellow amber while the Pond Reynolds on the right is a dark old amber. I just couldn't help throwing the one name bear into the picture. The embossing is so strong it just about jumps off of the bottle. I know that you did & now so does the whole world! Is that Samuel More the example from Blackie's collection? No, this nice group of fifths reside in Major Downie's old town. I'm not sure where G.O. acquired it. Nice light one though! I still have the Blackie example. It was found in Alta, back in the 1960's - not by Blackie. Two came out somewhere in the old Alta townsite. Most of the big 'early' mines were history by the early 1880's. Avalanches hit the town nearly every year, the 1885 slide pretty much put an end to the town. That sure is a nice Samuel More you've got there in the pic ! Dont think I've seen one with that yellowish tone, usually they are orangey or dark. Was it found recently? What can you tell me about it? I bought the Sam More from Everett L. at the Canyonville show 3 years ago. Not sure where Everett aquired it. 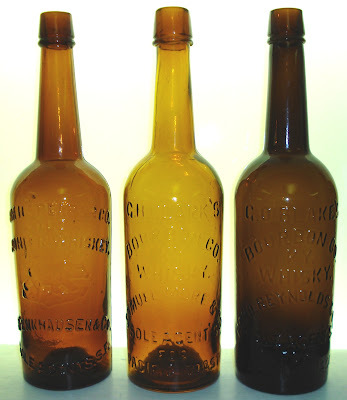 It has a small annealing or freeze check dead center on the reverse of the bottle. Do you know the bottle?